Free Kindle: Next week or next year, Amazon will start giving away its e-reader. Here’s why. Keep that record in mind when you hear my next report from Amazon’s future. Next week, the company is holding a press event in Los Angeles to introduce some new stuff. Many observers believe that we’ll see upgrades to the firm’s Kindle lineup. These include, according to All Things D, a new Kindle Fire that has a camera and a better display and, per TechCrunch, a “front-lit” E Ink Kindle, meaning one that you can read at night. If that’s the case, I’ll be ecstatic. But what about the entry-level Kindle, the model that now sells for $79? It seems certain that Bezos will lower the price of that device once again. The question is, how low will he go? I think the Kindle will drop to around $55; Amazon’s last price drop shaved 30 percent off the Kindle, and with the price of parts still falling, I think it could stomach a similar drop again. But let me go out a little further on that limb. I wouldn’t be surprised if Amazon drops the entry-level Kindle much lower than $55—all the way down to free, with a catch. The catch is that you’d have to pay for Amazon’s Prime membership service, which goes for $79 per year. In addition to free two-day shipping on 15 million products, Prime also gives you free streaming movies and access to a “lending library” of Kindle books. Now if you sign up to Prime, you’d get the Kindle itself free, too. Once again, I smell a bluff. The free Kindle plan sparks two questions. Why would Amazon give away an e-reader, and how could it afford to do so? Dig into each and you arrive at the same place: Amazon will make its Kindle free sooner or later. The only question is whether it will do it now, next year, or the year after that. First, why? Well, that’s easy—because Amazon’s long-term goal is to make money from selling content and general merchandise, not by peddling its own devices. It has never tried to make a profit on the Kindle; even now, it loses a few dollars on each device it sells, according to analysts who’ve researched the price of the Kindle’s components. Amazon seems to think of the physical Kindle in the same way it thinks of its fulfillment centers and the planes and trucks that carry goods to your house—not as a profit center, but as the necessary infrastructure for getting customers what they want. Every time Amazon drops the price of the Kindle, sales of the device and sales of Kindle books increase dramatically. When the Kindle first came out, there was some worry that even if e-reading got big, e-books would simply replace paper books, and thus the shift wouldn’t really alter Amazon’s bottom line (and could even harm the firm, since e-books are cheaper than printed books). But Amazon and others in the publishing industry have noticed that e-readers actually change people’s book-buying habits. Because the Kindle lets you buy and read instantly, you tend to read (and thus buy) more books than you did in the age of print. E-readers seem to turn infrequent readers into frequent readers. In the long run—and the long run is the only thing Jeff Bezos cares about—getting people to read more is very good for Amazon. Well, except for one thing: What if all those new readers go to some other bookstore? Apple’s iBookstore ships with every iPhone and iPad, and now that Google is making great tablets like the Nexus 7, its bookstore is also a threat. Wisely, Amazon allows its titles to play across all those devices—you can buy a Kindle copy of Fifty Shades of Grey and read it on your iPad, Android, and Kindle. But Amazon does not allow other stores’ books to get on the Kindle; if you buy the iBooks version of Fifty Shades, you’ll only be able to read it on your Apple devices. Do you see where this is going? If Amazon gives me a Kindle reader, it’s giving me a huge incentive to buy Kindle books on every other device I own, too. Even if I read e-books mostly on my iPad, I’d still want to go to the Kindle store so I can also read them on my (free) Kindle. For the cost of one gadget, then, Amazon has turned me into a Kindle book buyer for life. 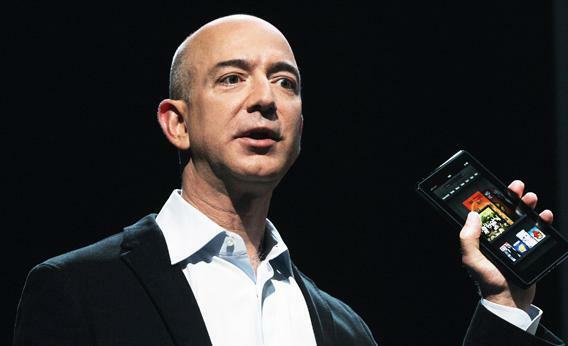 Even if giving away the Kindle would be a smart move, could Amazon afford to do it? The short answer is: At this point, no one outside the firm really knows. Amazon is the most opaque company I follow; it reveals even less about its operations and goals than the famously secret Apple, and Bezos relishes keeping people guessing. Nobody outside the company knows, for instance, how many Kindles Amazon has sold; how much money it has made (or lost) from the Kindle division; how much Amazon is spending on the digital content it’s licensing to give away to Prime members; and whether the Prime strategy is currently making a profit for the company. But we can make some guesses. First, like everything else in the gadget world, the Kindle’s component costs keep shrinking at a steady price. Last year, it cost Amazon about $85 to make the cheapest Kindle. This year, the price should go down to about $60, and the year after that it will be around $40. At some point, the Kindle will cross the threshold—it will get cheap enough that Amazon can justify giving it away in exchange for the increased purchases it expects you’ll make as a member of Prime. At that point the device becomes something like the discounted phone your wireless carrier gives you when you sign up for a contract. What’s that magic price—how cheap do Kindles have to get for Amazon to be able to give them away? That answer depends on how much Amazon expects it can make from you as a Prime customer. The company knows that Prime alters how people shop online. When you join the plan, you go to Amazon first when you’re buying stuff online, because you know you can get a good deal on shipping. As a result, according to Piper Jaffray analyst Gene Munster, people who join Prime double their Amazon purchases in the first year. On the other hand, Prime members are also more expensive for Amazon—all that free shipping doesn’t come cheap, especially if people use Prime to buy a whole lot of inexpensive items. Indeed, Munster estimates that Amazon might be losing $11 per Prime member per year. But remember all those shipping centers that Amazon is setting up in big cities? It turns out they’ve had a magical effect on the company’s bottom line: Over the last few financial quarters, stock analysts have noticed that the growth rate in Amazon’s net shipping costs has begun to fall. For the first six months of this year, Amazon spent 33 percent more on shipping than it did last year; but in the same period between 2010 and 2011, Amazon’s shipping costs had risen 82 percent. (See page 22 here.) This drop in shipping costs makes sense—now that Amazon is closer to your house, sending each item to you costs less. And this, in the end, is the reason the Kindle has to be free. The cheaper shipping becomes for Amazon, the more profit the company makes on each Prime member. And the more profitable Prime becomes, the more incentive Amazon has to get people to sign up for the service—and, thus, to give away the Kindle.